There are 2 persons who were not previously hoarders but turned into one that I can recall knowing in my life. The first person was a man who was involved in the share market. He used to be the most organized person I know because he could not be successful in his job if he was a messie. However, his life was filled with many tragedies. When he was young, he fell in love and married the love of his life who was his cousin. The marriage was opposed by both side of the families but they loved each other very much. They got married despite the objections and gave birth to a few wonderful children. Not long after, his wife developed womb cancer and passed away. Later, his daughter also got breast cancer and eventually lost the battle and passed away. By the time, he had already retired and was no longer working. After his daughter passed away, his behavior started to change. He started hoarding things- like the polystyrene packages that were used to packed rice, plastic bags and wrappers. Such polystyrene packages- no matter how you wash them, they would still have food stains and smell. He would stuff them at kitchen cabinets and be very upset when anyone attempted to throw it away. This man was very kind, but he was not the type who expressed his feelings. He kept it all bottled up inside. Eventually, he passed away from a heart attack. The second person was a single mother of 2 children. Her eldest son was a year older than me. Somehow, she suddenly got rich and was able to renovate her entire house, literally redoing the house structure. However eventually both her kids left her and she was staying by herself. It was after her grown children moving out that she started hoarding stuff. I mean, literally hoarding and it was very obvious. She would visit some of the nearby homes and actually scavenge their rubbish bins for unwanted items and basically rubbish. She would also collect unwanted furniture, unused laterns and plastic flowers and literally bundles of rubbish. These things gradually filled up the compound of her house (I am not sure if she did the same inside her house). Her once beautiful house has aged without care and looked very much like a rubbish dump from outside. Neighbors spoke of the stench, rats and fire hazard of the place. She also said that other causes include deficiencies of their early development, usually in the first three years of childhood. Feelings of abandonment as a child may also result a person to hoard material things…. because even though people may leave, but physical objects would not leave them. Those who do not allow themselves enough time to grieve after going through a loss – the confusion and loneliness may be compensated by external disorder. Also, when a person suddenly find themselves having lost someone (through separation or death), they may lost their sense of direction and purpose in life. Such inner chaos and confusion would manifest themselves outward in their care for inner surroundings. Still, it does not mean that each time you see a home being messie, that means something is wrong with the person. Sometimes they may be just overwhelmed and would appreciate external help to clean. In my home, my mom is also showing signs of being a messie- she does not throw biscuits or food wrappers in the dustbin but instead put them around the table and chair surface. For her, it is more of her forgetfulness (and she has Alzheimer like symptoms). But, if a person is a hoarder due to some inner conflict, he/she would get very upset and angry when you try to offer help, or heavens forbid, got rid of their stuff without their knowledge! For such persons, even if the “Hoarders” crew came and do a thorough clean up and got rid of all the junk, they would be back to hoarding in no time. In fact, the sight of a clean home may overwhelm them greatly. Self help books and the many inspirational YouTube videos that even show how it could be done step by step ….would not be of much help. Further in her book , Linda also mentioned that she had worked alongside Veronika Schroter, a psychotherapy practitioner and compulsive hoarding specialist in Freiburg, Germany. She also shared insights from Veronica’s findings in her book which I hope it would be useful for those who wish to get out of the habit of hoarding or are family members/friends living with hoarders. 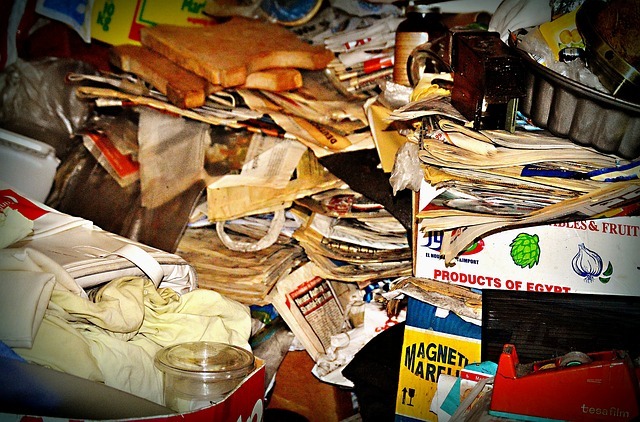 Therapy, both group and individual sessions can help a person with hoarding tendencies. By analyzing their life story and tracking down the causes, they need to learn to lovingly accept themselves with their story. They rediscover their own dignity and self esteem. Out of their own initiative, they are able to tackle the mess step by step. Most of the time, we need to address issues with hoarding due to hygienic reasons, as well as if we have children at home or to avoid the mess to be a tripping hazard. It would also need to be addressed due to complaint from landlords or neighbors. If we were to live with a family member who is a hoarder, cleaning up or getting someone to clean up the mess would not help as it does not instill the sense of responsibility in the person. It actually made the person felt worse. In the book, it is suggested that a messie is brought to an individual group or counselling. It is helpful for them to be able to share with other sufferers where the isolation is broken and they receive help and support for their own healing journey. However, there are exceptions depending on the scenario. In the case of my mom who is elderly, forgetful and frail, I find it easier for me to clean after her than to get her to change. It happened before that I have gotten upset with the mess and nagged her for just discarding wrappers all over the place like table surfaces, floors and the empty chair next to her. She became so upset and threw a tantrum, lasting about few hours (till she forgets about it). It was not worth it as I would need to spend even more energy to pacify her. As I am staying with her, I am able to clean up the pile of used wrappers immediately but I usually do it after she leaves the area as sometimes she may insists to keep those wrappers to help ‘wrap up prawns’ (in the past when she still cooked she would buy prawns back, washed them and placed them in small plastic before putting in the fridge) or other foodstuff. I would try to clean as soon as I could as some of these wrappers have food bits left in them (like chocolate stuck to wrappers) and biscuit crumbs that dropped on the floor.